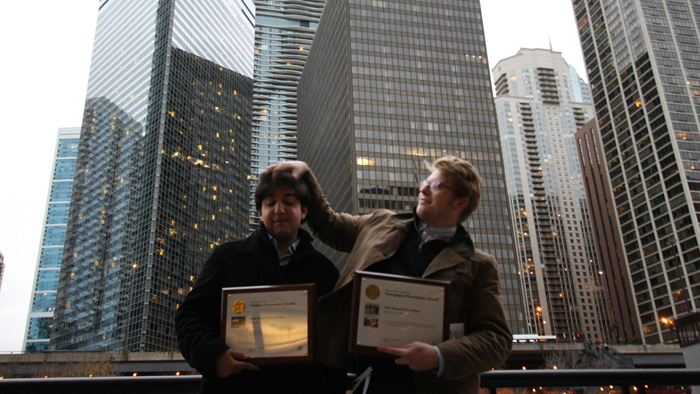 The Free Press’ Miles Kohrman edits Rey Mashayekhi’s hair at the Associated Collegiate Press Convention in Chicago. Photo by Miles Kohrman, 2012. Make room, Seymour Hersh; aspiring New School reporters have an eye towards careers in investigative journalism and they’re already making news. With a new emphasis on long-form stories, The New School Free Press picked up two prestigious Associated Collegiate Press (ACP) 2012 awards at the annual ACP/CMA National College Media Convention in Chicago this November—firsts for the publication. Six members of the Free Press editorial board accepted the Newspaper Pacemaker award for four-year, non-daily newspapers and the Online Pacemaker award for schools with an enrollment of 5,001–10,000 students. Writing for the Free Press is a course led by Heather Chaplin, assistant professor of journalism, and Andrew Meier, assistant professor of writing at Lang. This semester, the Free Press boasts a large class of 27 student reporters who, in addition to their duties to the paper, have packed academic schedules.